« Are you a family history investigative reporter? I needed to do something a little different with regard to adding media and information to my genealogy software since I decided to do a separate “research” database (in Family Tree Maker) and a “sourced” database (in Roots Magic). And I still need to get a grip on the somewhat willy-nilly approach I’ve been using since finding so much information available online. 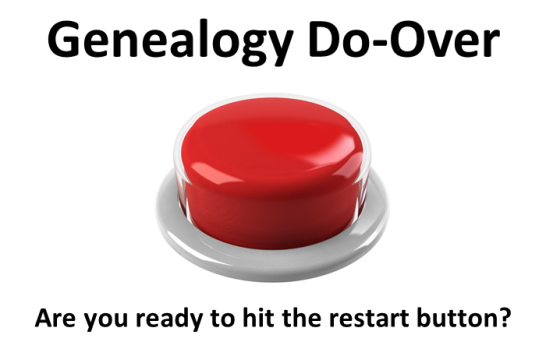 I still want to use OneNote in tandem with my genealogy software. I know some of the things I am doing in OneNote can be done in my software but the software has its drawbacks. One, I can’t spread everything out to view at once, I have to open each document separately. When I put screen clippings into OneNote, it helps to be able to “view” it all at once. Two, I don’t like either Roots Magic or Family Tree Maker’s timelines. They don’t suit my purposes as I like to make notes of conflicting or missing information right on the timeline. It then becomes the pre-research plan. Later, I can copy and paste research notes from OneNote into my software if I decide I want that information in my genealogy database. The trick is to remember to date everything so I know whether or not the software has the latest notes. 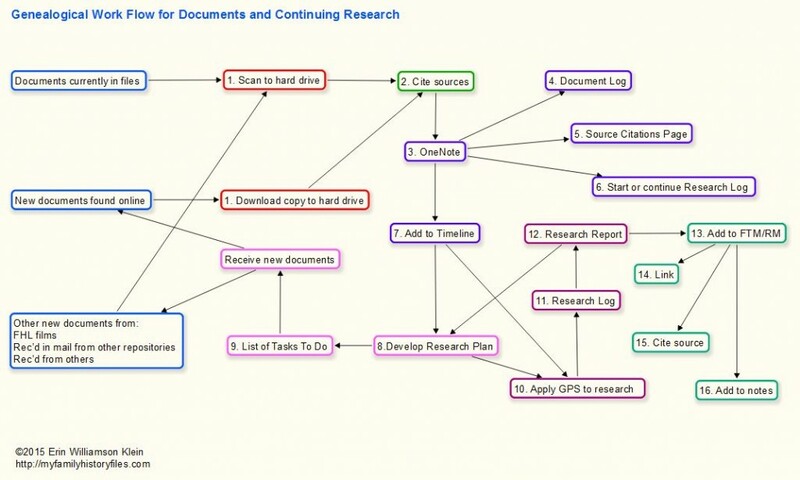 I was playing around in Scapple (mind mapping software from the creators of Scrivener) and made myself a chart back in July 2014 to illustrate (for my own purposes) how I should be working with the documents I already have. They need to be scanned, the information extracted and added to my genealogy databases. New source documents are coming in as well so they need to be dealt with. Obviously all the steps aren’t necessary for every document but I wanted a checklist of sorts to be sure that things get added to OneNote and timelines. You’ll notice that the last steps include putting the information in genealogy software. All of this is subject to change because I tweak things as I go. 1. I want to set aside 2 days per week to work on family history. I need to pick 2 days and stick to my plan otherwise I get wrapped up in quilting for days and weeks on end and don’t get back to family history research. (Case in point is this post. I had to drag myself away from my quilting software where I have spent the last 3 days drawing an applique quilt border.) I am thinking Tuesday and Wednesday because those are the 2 days the local family history center is opened. I can only get there every other week but at least I know it would be open if I decided to go and do some research on my designated genealogy days. 2. The To-Do List… One long list or many little lists? I’m leaning towards one list because I like the way everything shows up in a prioritized list when I open Family Tree Maker. But the question is where to put the one list? Maybe one list for each of my 4 surname notebooks? Yes, I think I will play around with that idea. Now my OneNote Surname Notebook looks like this when I open it. The very first section is an Inbox. Anything I clip from the web ends up in the Quick Notes section of my personal ON notebook. I then sort through those web clips and add them to the appropriate Surname Notebook Inbox unless I know exactly which Family Group Section it belongs to — then it goes there. The next section is for my new To-Do List. It’s just a tickler list of things that need to be done. More elaborate plans and information are listed on my Research Plan and Research Record in each Family Group Section. 6. The PDF handout for the audio podcast listed above. Erin Williamson Klein, “My Work Flow.” My Family History Files, 14 January 2015 (http://myfamilyhistoryfiles.com/organization/my-work-flow/ : [access date]). Hello Erin, I had already added a To Do Tab as the first tab in my main page of my Surname notebooks. I have recently also decided to make the switch to Roots Magic but hope to do all my research in OneNote and then add the information to RM. The only exception will be to add my source citations in RM first, since the templates/sourcing is the main reason I decided to switch to RM from FTM. I will then copy the citations into OneNote. I understand your OneNote Direct and Non-Direct section groups, but I don’t see how to add siblings of my direct line ancestors. How do you handle them? I was thinking of either adding a 3rd section group for Indirect or adding them as pages under the Father. What would you suggest? Thank you for your OneNote posts and also all of your other suggestions. My switch to Roots Magic for my sourced tree is the same as yours — the ease of adding citations. I can’t remember if I heard this in a video (Crista Cowan? Roots Magic?) or if I read it on a blog, but someone suggested going up a direct line fixing mistakes/adding citations and then branching out to siblings as you come back down the line. My main focus right now is the one surname (Williamson) and going up my direct line, but I do have some sibling information in my notebook. Adding a page under the father until the sibling becomes a family group of its own makes the most sense to me. I think I am going to answer your question in a post so I can show you what I have done and what I plan to do with the siblings. Hahaha, Jan. I do wonder about the readability of my posts as I have a quirky sense of humor and sometimes think I am being too detailed in my posts. I’m glad someone is enjoying them. 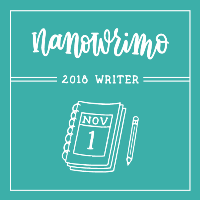 Writing during the NaNoWriMo.org challenges is very enjoyable for me–less stressful than trying to make everything perfect for a blog post. There is no editing as you go, so I just write, write, write.